This time of year the maize has already shot up, in some cases it is over 7' high. The maize is planted quite densely and the cobs tend to grow nearer the head than the ground (obviously there is more light up there!). This tends to leave a dark sheltered space from the ground to about 3 feet high which is perfect cover for foxes. Already, I have heard of a few horror stories where foxes have used maize as camouflage for a poultry raid. Sadly these raids occurred in broad daylight (unusual for a fox) and resulted in the loss of some excellent egg layers. The moral of the story is simple - make sure your chickens are well secured - even in daylight! Shortly after the chickens had started disappearing I received a call from another neighbour with an altogether different fox problem. 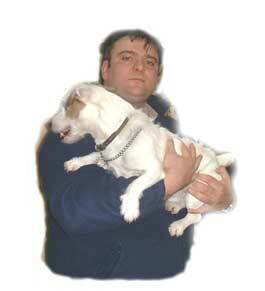 A fox had gone to ground near his yard and was being kept at bay by one of his Jack Russells. It appeared that the fox had been injured. I went down to have a look and didn't see the fox in the long grass until I tripped over him! Interestingly, old Reynard didn't budge an inch when he saw me. I moved over to him and he still refused to make any attempt at escaping. I did a quick visual and everything looked to be okay, no lesions, scabies, mange or broken limbs evident. In fact, his general physical condition was one of the best I have seen for a very long time. The animal was, however, panting very heavily and appeared drowsy with laboured breath. The assembled company reckoned he was either badly dehydrated or suffering from the effects of some disgusting poison. In any event he was very disorientated and in no small measure of distress. I dispatched him swiftly and painlessly (note:-in an RSPCA-friendly way!). The animal was an adult dog fox, weighing well over a stone in weight and made quite an impressive sight even in death. Since then the daylight chicken raids have stopped so perhaps this fox was the culprit? Maybe this particular animal had been ill for some time and had resorted to taking the risk of hunting in broad daylight as a last resort. We are still surrounded by many foxes who come prowling around the chicken coops looking to see if we have left any trap doors open for them. Foxes love these easy targets and seize the opportunities they afford with ruthless alacrity. Our current visitors, however, have the good sense (and the good fortune!) only to come out at the dead of night. We set off from Chichester at around 6.15 pm and by about 6.40 we were in open water in The English Channel. The bar (a submarine obstacle) outside Chichester is an area of shallow water that causes massive turbulence at certain times, particularly when the tide is running out of the harbour and the wind is blowing to the North, or vice-versa (a condition yachtsmen refer to as "wind -against-tide"). That is precisely what we had. The sea was so rough it looked like it was water boiling in a pan. We spent a very fraught hour being tossed from wave to wave I am sure my spine compressed a few inches going towards The Solent. Anyway we reached calm waters and rocketed Westward to Cowes. After a brief tour up and down the Medina River we moored up in Cowes Roads and watched one of the most spectacular fireworks displays I have ever seen. One hour, several beers and a few sandwiches later we made for home, driving in pitch darkness using a digital chart plotter. What an experience - one I hope to repeat soon! 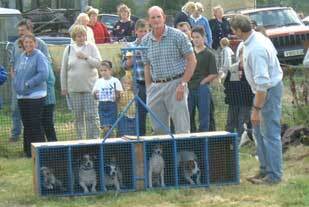 The 12th August saw a terrier racing day at the Crawley and Horsham Foxhounds kennels in West Grinstead. The day kicked off at 3.00 pm sharp with several races. Terrier classes were followed by lurchers and other sight hounds along an uphill course about 70 metres in length. For those who have never seen this wonderful little pastime I will briefly describe what happens. 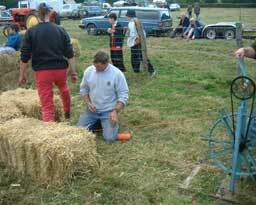 The procedure is wonderfully simple:- a continuous loop of baling twine is pulled along the length of the course around a few pulleys and a flywheel. the "flywheel" is actually a 27" bicycle wheel (minus tyre & tube) mounted on a frame which allows it to be rotate by a single pedal crank. Tied to the baling twine is the lure. This is a foxes brush and its scent is irresistible to any self-respecting terrier! Young Stuart Humber manned the trap with great skill and dexterity, managing to get bitten by a few truculent little dogs for his pains! The traps consist of a large wooden box, partitioned into five compartments (six actually Simon - too much time in the beer tent I think DT). Each of these compartments has a little hatch at the back of it where the racer is inserted, prior to the start. The front of the trap consists of a smooth wire mesh grille with a long handle that is hinged at the top of the box. The race begins when the brush is pulled down the course and the trap door is pulled up rapidly. Pandemonium ensues as five bloodthirsty terriers jockey for position and attempt to catch up with the rapidly retreating lure. Towards the middle of the course there is usually a "gate" that consists of a few bales of straw arranged to form a bottleneck in the course. The idea is that only one or two dogs can get through at a time. This should theoretically create a clear 1-2-3 finish. Unfortunately the practice is somewhat different. Terriers being agile little buggers have little or no difficulty in leaping over two bales of straw! Indeed, the aerial route would appear to be less time-consuming than the proper course. This then creates the situation where tail-end Charlies can come through from behind to finish superbly! The finish line is a repeat of the "gate" principle that somehow manages to "guarantee" a clear winner. Each race began in chaos and generally ended up the same way, with a few thrills and spills en route! I am pleased to say that my little lad, Jasper, won all of his races by a few clear lengths. 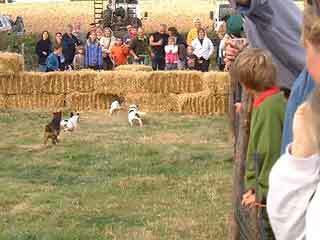 If you get the opportunity to watch a terrier race, do so because a well organised event will guarantee many laughs. (i) The efficiency of the drainage channels that have been constructed. ii) The incompleteness of the resurfacing work carried out. Rainwater is still sitting on depressions in the road where remedial work is yet to be carried out. I spoke to the council on this matter. Not surprisingly, it appears that different departments are responsible for the road surface and the verges. The situation is complicated further by the fact that the council believe that the North/South boundary demarcation line runs through the middle of Park Lane. Therefore it is necessary to arrange for 2 lots of work to be done by two separate contractors! Does anyone have a fool-proof method of getting rid of thistles? I let a few go to seed earlier this year and the results are horrendous. I have tried some SBK w which seems to kill the current crop off but more keep returning. I don't want to use Sodium Chlorate so if anyone knows of a good (and permanent) method of thistle removal I am very keen to hear about it. Free beer for the best suggestion (claims in the forum. DT).